Lets face it…we live in Southern California and casual is always in style no matter what you are doing…. so for those of us that are still with longer hair its always a challenge to find a fun style that can help keep our necks cool…Caroline found this higher placed bouncy thoroughbred tail comes in very handy and is easy and to do!!!!!! The last person that created a ponytail this perfect was a toy designer at Mattel on a Barbie Doll !!!!! To get a similar effect in real life Caroline found the this technique below works quite well for most hair textures!!!! After you have washed and conditioned your hair with the Aveda Collection of your choice, spray some Aveda Volumizing Tonic on damp hair, rough-dry it, and then curl your entire head with a one-and-a-half-inch curling iron. After apply Pure Abundance Hair Potion Volumizing through your roots and back-comb them, then pulled all the hair into a ponytail at the back of the head. To get the lifted tail, grab each side of the ponytail and pull them apart to tighten the elastic, then tease the underlayers. 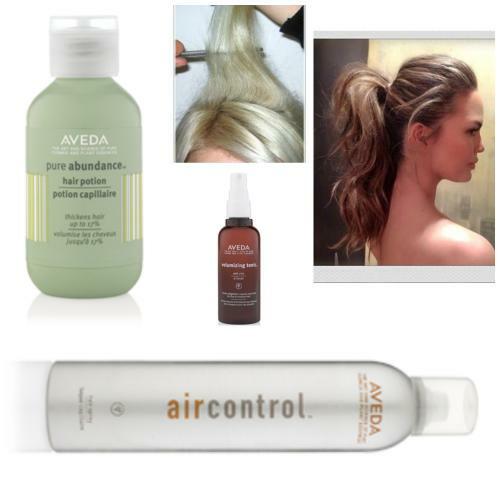 Finish the look with Air Control Hair Spray (quick tip – hold the can 6-8 inches from dry hair, directed away from eyes, and spray in short bursts) Layer this product to build more hold & this look will stay all day!!! !